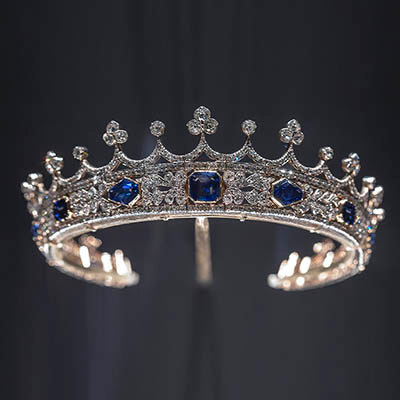 Being in Paris during the 2018 Fall Haute Couture presentations last week, that take place parallel to the High Jewelry events, got me to thinking about the rarefied art of fashion. The one-off garments can take hundreds of hours to make. When clients order a dress, it is expertly tailored by the couturier’s team in a couple of specialized fittings. Obviously, Haute Couture clothes are expensive. A modest guess at the starting price would be in the $10,000 range and go right on up to six-figures. In an Haute Couture collection, traditionally the most magnificent, the highest of the high, is the wedding gown. The importance of the garment used to be such that it was always the last look of a show. Now, couture clients are quite a bit cooler than they once were and designers do mix-up how they present things, but clearly a couture wedding dress is still something pretty special. So, the jewelry question is where my mind naturally wanders when pondering the idea of such a magnificently-made gown. What kind of an engagement ring would today’s couture bride want to wear? I imagine it would have to be something amazing with incredible gems obviously and as many gorgeous details as her sensational clothing. 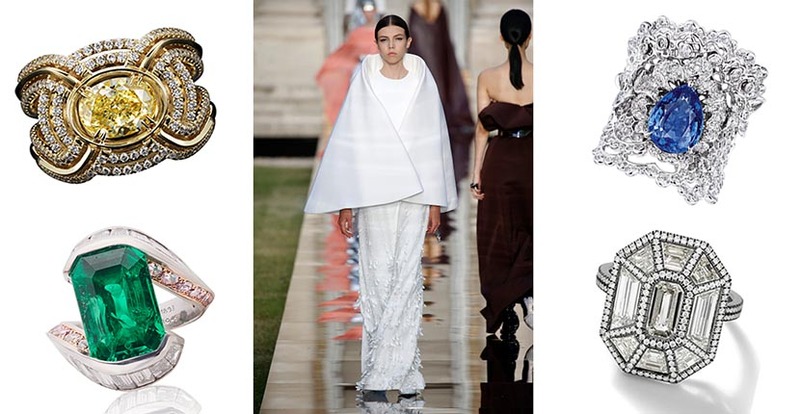 Following are several rings that feel like they would be right in line with the couture client’s mindset. 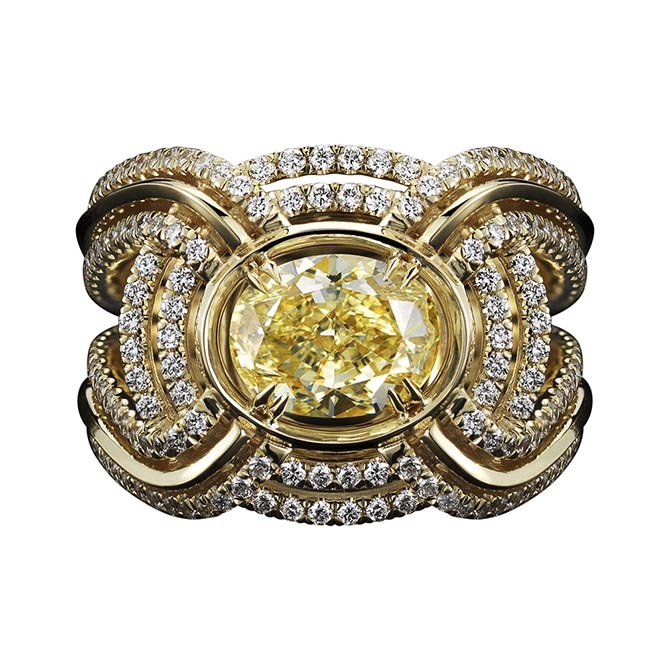 This spectacular ring by Alexandra Mor may not look like an engagement ring to you, but it is. 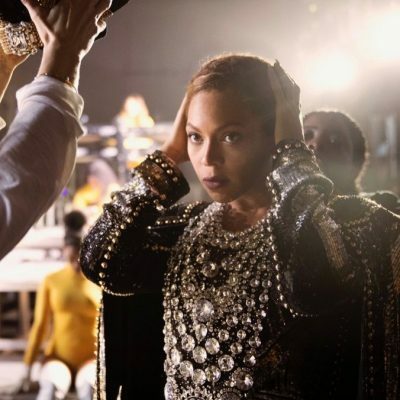 The super stylish beauty editor Kahlana Barfield had the very first rendition of the design. The version shown here centers on a 1.80-carat oval shape yellow diamond surrounded by swirls of diamonds and yellow gold. 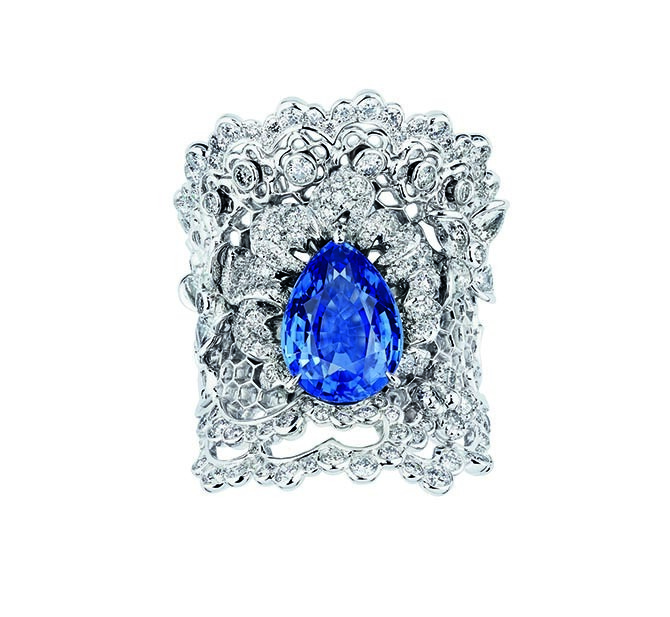 A sapphire accent is one chic way for a couture bride to add “something blue” to her wedding day look. 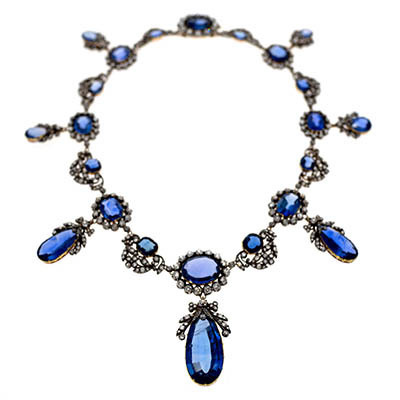 This Dior sapphire and diamond jewel would be a refined and original choice. It is comes from jewelry designer Victoire de Castellane’s 2018 High Jewelry collection for Dior, dubbed Dior-Dior. The designs were inspired by fabrics used in Haute Couture. 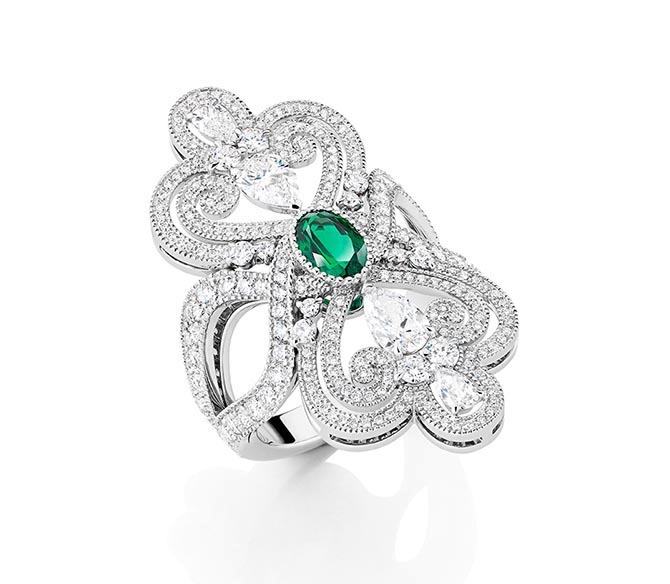 Eva Fehren’s amazing Exploding Emerald ring was the winner of the Best in Bridal category at the 2018 Couture jewelry show in Las Vegas and it would be perfect for a bride who shops for her wedding gown on the Haute Couture runways in Paris. The jewel is composed of 1.94-carat custom-cut diamonds and pavé-set diamonds in blackened platinum. You are not supposed to wear an emerald as an engagement ring, because the gem is relatively soft and could be scratched or damaged with everyday wear. The Duchess of Windsor, however, had an emerald engagement. 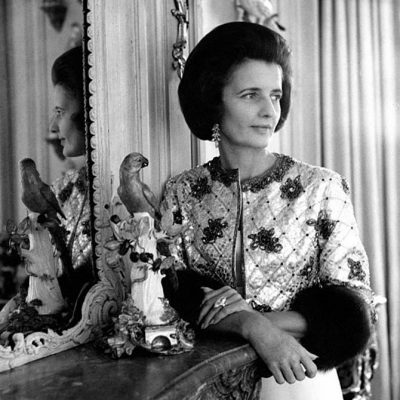 It’s an example that illustrates a woman leading a luxurious life can be careful with her jewelry. 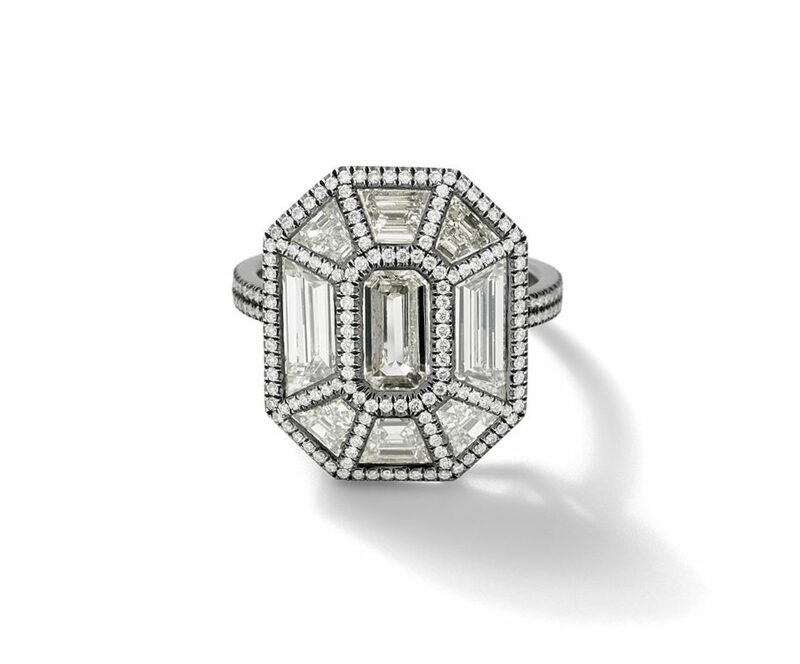 This Alexandre Reza ring is a modern spin on the emerald-cut diamond the Duchess flaunted. 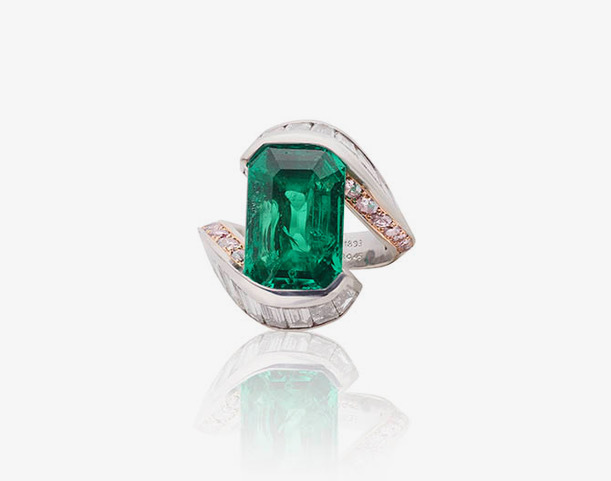 The 5.33-carat Colombian emerald at the center is embraced by a ring highlighted with 24 trapeze-shaped diamonds weighing 3.65-carats and .45-carats of fancy pink brilliant cut diamonds. Maison Auclert, a tiny boutique on the Rue de Castiglione situated between the Tuileries Garden and Place Vendôme, is a destination for sophisticated jewelry clients looking for something that blends sense of history in statement jewels. The vast majority of the carefully curated selection is pieces with antique art objects mounted in bold gold designs. 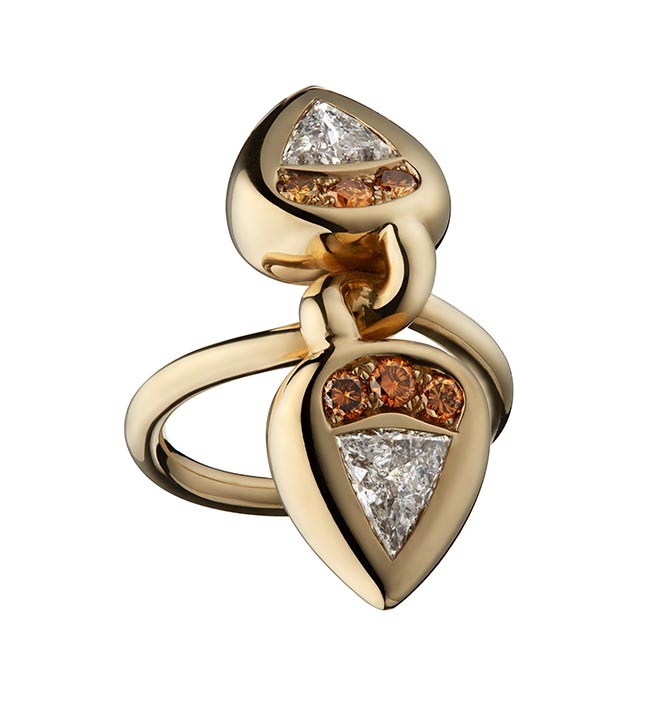 This 18K gold Double Snake Ring with 2 triangular diamonds and natural orange diamonds doesn’t have an ancient treasure in it, but it does reflect the magnificent sensibility of the Maison. The silhouette echoes moi et toi rings, designs with two diamonds that reflected the idea of a couple coming together in marriage during nineteenth century and early twentieth centuries. Mellerio is the oldest jeweler on the rue de la Paix, the street adjacent to Place Vendôme, the location I consider Ground Zero for High Jewelry. One of the services Mellerio still carries out for its well-heeled clients is customized engagement rings. The Arabesca ring above from the French firm’s new Isola Bella collection is not a custom piece or necessarily an engagement ring, but it gives you a sense of the potential for a romantic design. 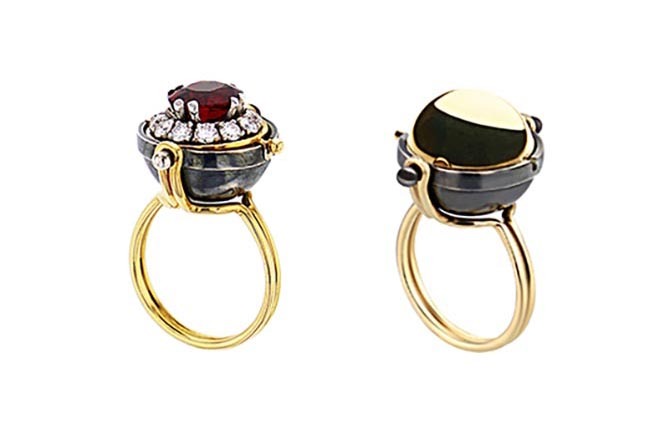 Before he began creating fine jewelry under his own name, Elie Top created the magnificent costume jewelry at Lanvin under the direction of designer Alber Elbaz. This experience infuses his work with a sense of elevated whimsy. The designer’s signature Mécaniques Célestes Bague Sirius Rings are the perfect example of his style and ideal engagement ring for an avant garde bride. The globes in the center of the jewels operate as little covers that open and close to conceal or reveal diamonds and colorful gems. There is a selection of the pieces in Elie’s permanent collection. He also mounts family diamonds for clients who are looking for a chic new way to wear a stone. The engagement rings of Taffin designer James de Givenchy have long been the dream choice of fashionable brides. I have seen beautiful Taffin creations on New York women that are a elegant spin on classic engagement ring silhouettes. 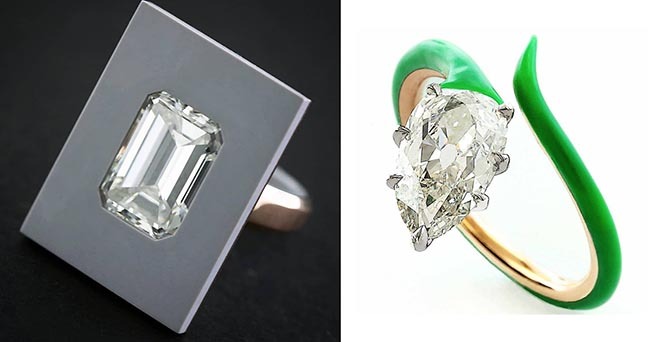 The imaginative designer, who is nephew of the celebrated couturier Hubert de Givenchy, also makes diamond rings with his signature ceramic details that are as cutting edge as any of the most daring Haute Couture.